Today we begin our second week of connected learning. 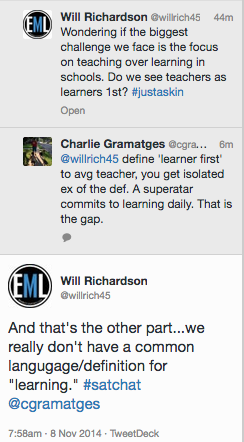 Most of our “10 minutes” so far have been about lurking and learning, which is great. Finding out where to go online to learn what is happening is a huge first step in getting connected. You need to feel some confidence with the online environment to really be able to leverage it for your own professional learning. But if everyone just “lurked”, and pulled out what they needed, there would be nothing to “pull out”! 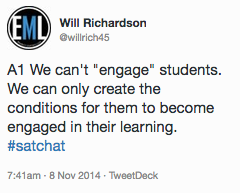 We ask our students to share, and we need to model that as well. In our 30 days of getting connected, we are working towards full engagement as a connected learner – contributing and challenging, learning and sharing. When we are learning face-to-face, others can see and hear what is going on. 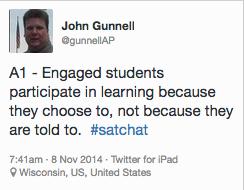 They can choose to observe, or to join in the conversation. Online learning is different in that we need a few tools and access to digitally wander in and learn more about it. People can tell us that we should “get on Twitter” because it’s an amazing place for professional learning, but it is difficult to form a concept in our minds of what that is all about if we have not directly experienced it. This morning, we take you inside a “twitter chat”. 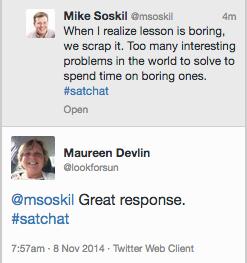 Twitter chats use hashtags to aggregate the tweets on a specific topic. Normally, they occur at a specific time, and educators often answer questions posed by the moderator (questions appear as Q1, Q2, responders put A1, A2 etc. as part of their answer). 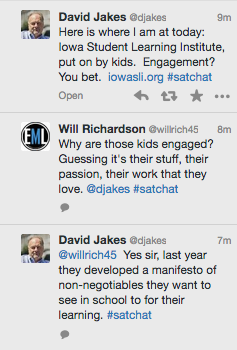 There are twitter chats for every possible interest in education. There are chats for every grade, every subject area, principals, new teachers, special education, every time of day, you name it! One fairly comprehensive list of twitter chats can be found here, though there are still many more to add. 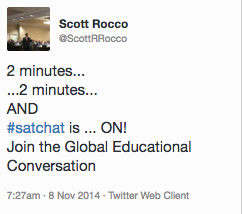 Every Saturday morning, a diverse group of educators meet online on Twitter at 7:30 a.m. EST for #satchat. They share and challenge each others’ thinking in rich conversation. 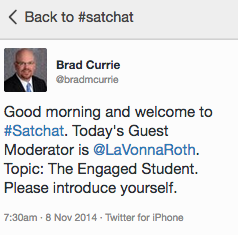 This morning, we share some of today’s #satchat with you, so that you can see what actually happens in a twitter chat. 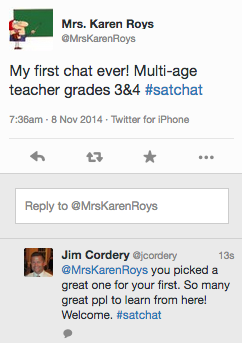 When you are ready, try joining a chat that interests you. 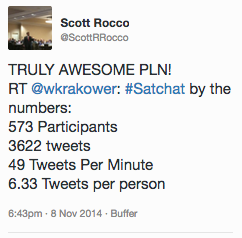 Twitter chats can seem a bit overwhelming to newly connected educators at first, especially if you join a very large chat (for example, #satchat had 573 participants and 49 tweets per minute this morning). 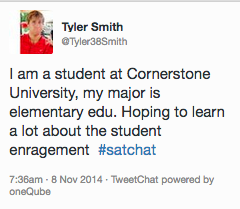 It is very important to realize that you are not going to keep up with every posting by every educator. Tweets are collected and posted in another format so that you can always go back and read all of the contributions at a later time. Focus on a few contributors or even a single conversation until you are more comfortable with the tool. 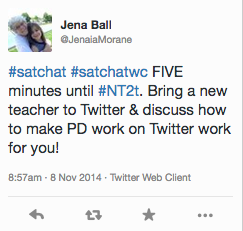 If you already use twitter chats as part of your PLN, what chats have worked well for you, and what do you learn by participating? 1. 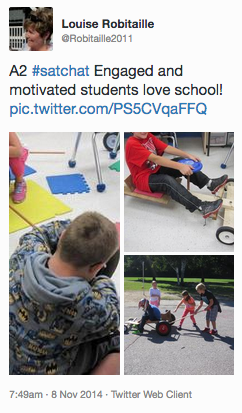 Silvana Hoxha, Vice-Principal and connected educator in the Waterloo Region District School Board generously shares her journey with us in how she began to use Twitter for professional learning. 2. Wayne Toms, ITS and Planning Manager at Limestone District School Board discusses his experience in using Twitter as a Professional Learning Tool. 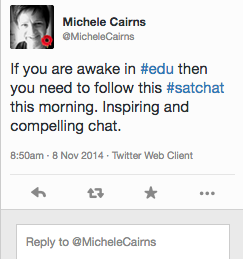 Here are a few excerpts from #satchat, Saturday November 8, 2014, 7:30 a.m. EST. 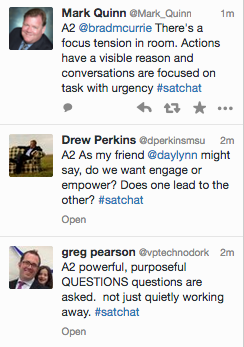 Search #satchat on Twitter for the full conversation. Leave comments here if you need support in accessing this form of professional learning and we will guide you.